NEST’s retirement blueprint is a useful glimpse of what could emerge as future best practice in the provision of through-retirement investment strategies. As the only provider compelled to share and consult on its internal thinking, NEST is evolving into a hub of innovation that is yet to be matched by commercial providers. NEST’s blueprint for retirement is sensible, evidenced and intellectually robust. So its six principles for NEST’s retirement blueprint deserve attention as this is where the material differences to traditional retirement propositions are explained. First: “living longer than expected and running out of money is the key retirement risk”. We agree wholeheartedly that ‘shortfall risk’ is the key retirement risk, and one of its key parameters is time. Shortfall is a very different type of risk than the traditional measure of risk in accumulation, which typically looks primarily at expected volatility. Retirement investment solutions therefore require a very different approach to risk budgeting, risk management and associated portfolio design. Second: auto-enrolment savers are likely “to spend most or all of their pension pots during their retirement”. This closed-form approach in turn impacts what would constitute a safe withdrawal rate, in the absence of an allocation to a legacy pot. Third: “income should be stable and sustainable”. For this reason, capital should not be invested in assets that are illiquid or thinly traded. Likewise, NEST cautions that retirement capital should not be “allocated to excessively risky or over-valued assets in order to generate sufficient income”; this seems sensible. High income yield from a portfolio is not the same as a carefully managed portfolio that is drawn down to provide a stable and sustainable income for the retiree. Fourth: “managing risk is crucial as volatility can be especially harmful in income-drawdown-type arrangements”. Whereas sequencing risk can be damaging in accumulation, it can potentially ravage a portfolio where there are regular withdrawals and no future contributions to mitigate the impact. An active approach to volatility management therefore has a key role to play. Fifth: “providers should look to offer flexibility and portability wherever possible”. From an investment perspective, underlying liquidity is once again a factor here. Portability will be more complex where annuities of any sort are involved. Sixth: “inflation risk should be managed but not necessarily hedged”. A managed approach to inflation could be explicit (through the inclusion of inflation-linked bonds) or implicit (through the inclusion of a modest allocation to equities and real assets to offer some inflation protection). The cost/benefit of an actual guarantee may not be worthwhile. These principles resonate well with international best practice and are founded on robust theoretical and practical bases. Converting those principals into propositions will remain a harder challenge, but the initial blueprint suggests an asset allocation glidepath over time that allocates to a cash fund for flexibility, a later-life protected income fund for longevity and has at its core an income drawdown portfolio that is designed to last the course. 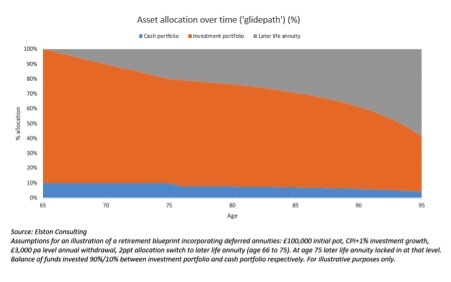 This suggests that the shape of retirement investing for most savers is likely to evolve rapidly away from a funds-only approach to become multi-dimensional in its challenge, and multi-product in its delivery. BirthStar is a research and advisory firm for asset managers and intermediaries specialising in proposition development around target date strategies.